I don’t eat cans of Vienna sausages with saltine crackers very often, but when I do, I’m in a bass boat. My family and I used to have a Christmas tradition of fishing out on Lake Kissimmee for large mouth bass. These were incredible moments filled with hearing and sharing stories of the past, catching the big one, and falling asleep out there without a care in the world. In preparation for the 2019 Daniel Fast, God convicted my heart and my motives. My desire was to hear from Him, seeking His guidance and intervention with concerns in my life and my family’s. However, I approached Him with idols and an unclean heart. The 21-day Daniel Fast is about to begin. My wife and I are stocked up on nuts, quinoa, and unsweetened cocoa powder (if you’ve done the fast, you know about the no bake cookies), and I’ve already been scouring the internet for possible recipes. My mind is extremely focused on the food, and especially the caffeine, I’m about to give up. For 21 days, we put down cheeseburgers, cake, tobacco, coffee, etc. and it can be very tempting to fixate on those things. My encouragement/challenge to you during this time is this: fasting is not so much about your stomach, as it is your heart. The Daniel Fast is a partial fast, which means that we will eliminate some common things from our daily diet, but will have generous options available. As God blesses your life, we encourage you to write down your prayers and experiences. Praise God for the renewed relationship you have with Him and the fresh perspective for the things He has in store for your life. *If you have any medical conditions or suspect such conditions, consult your doctor before beginning the fast. 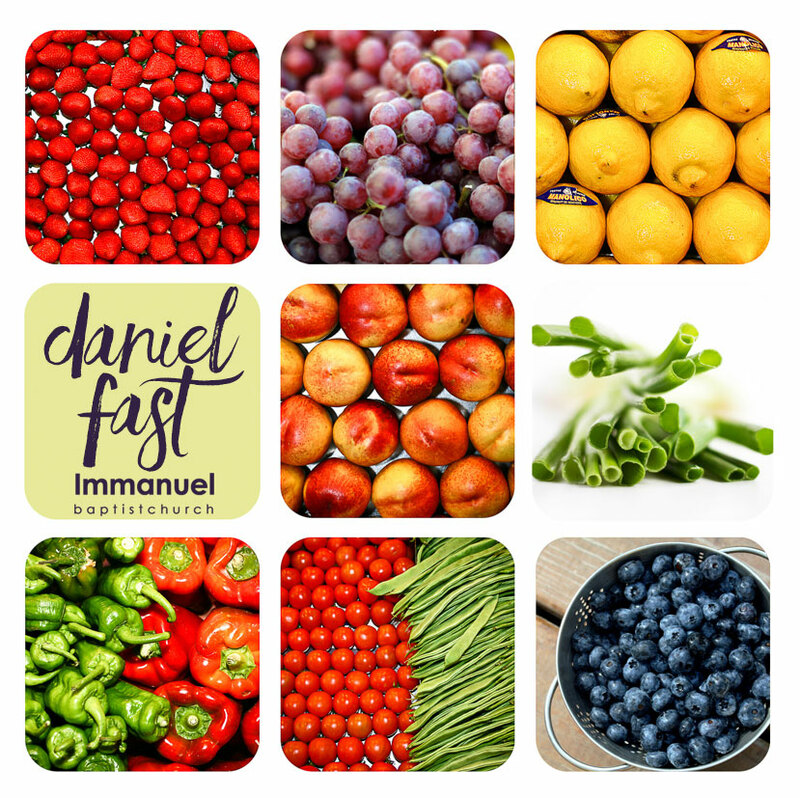 If this is your first time doing the Daniel fast, here are a few tips to help you get started. 1. PLAN AHEAD – You will spend more time in the kitchen as you prepare each meal, so it is best to plan your meals ahead. 2. DOUBLE IT – When you find a recipe you like, make double the recipe. This way you will have leftovers for those days when you are just not home as much or you can take it to work with you for lunch. 3. GIVE YOURSELF MORE TIME TO SHOP! – You will spend more time than usual at the grocery store in the produce section, as well as searching for ingredients you may not usually purchase. 4. BUDGET MORE FOR GROCERIES THIS WEEK – Fresh foods and organic foods tend to cost a little more, but remember that you are not eating out so the money you usually spend in restaurants you are now spending in the grocery store. 5. WATER, WATER, WATER – Water is a great filler when you get a little hungry, but also, our body needs lots of water anyway that we don’t usually provide it. Because you are not drinking as many other liquids, make sure to drink plenty of water. The first few days of the fast it is especially important to drink lots of water because you will most likely experience headaches. The more water you drink, the less intense and frequent your headaches should be. The first day of the fast, try to drink a gallon of water. This will help ward off headaches and aids the detoxing process. 6. MORE BATHROOM BREAKS – It’s the truth! Because you are drinking lots of water, you will naturally have to use the bathroom more often. But, this is good. It means your body is riding itself of toxins! 7. TURN OFF THE TV – I’m not saying that you can’t watch any TV while you are on the fast, but I would suggest limiting your TV watching. For one, at night can be your ‘weakest’ time, and you can only watch so many pizza commercials before you are more concerned about pepperoni and cheese than you are what God might be speaking to you. Also, we have to leave extra time in our day while we are fasting for God to speak to us.